Good To Begin Well, Better To End Well: Talking about Eve in the Fate of the Gods trilogy and Beyond! Talking about Eve in the Fate of the Gods trilogy and Beyond! In honor of BEYOND FATE's forthcoming release on September 16th, I thought I'd point you all to my previous posts on Eve, just in case you missed them somewhere along the way, and to set the mood for the EPIC CONCLUSION to her story. 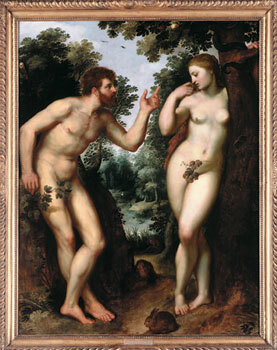 "Eve as sinner/temptress, is so often used as a convenient scapegoat for, if not outright architect of, all the woes of man, which itself is problematic (not unique, mind you, as Helen of Troy is another example of a woman put into this same position, we just haven't based the entirety of western culture upon her "mistakes"), but it becomes a very troublesome interpretation when it is compounded with a more literal and conservative approach to Biblical Myth, which places Eve as the archetype of all women, painting us all with the same brush and giving us all the same perceived "weaknesses" as a result." like Adam is the one doing the seducing! Oh, Eve. So often the seductress in her imagery! But we don't give much thought to her pain or her suffering -- to her loss, even her sacrifice. But Rodin did. And his sculpture is both heartbreaking and beautiful in its perfection. I'm really glad I had the opportunity to see it for myself, and share those images with you all, on the blog! "So what if Eve had agency? What if she understood what she was doing, and all the ramifications, all the consequences? And what if, even knowing all that, eating the Fruit was still necessary? What if what was happening around her compelled her to consider that option and make that choice, eyes wide open and heartsick?" A little bit more about why I wanted to retell Eve's story -- it all goes back to a pamphlet I photocopied on a long ago day. Eve has an understated strength, I think, more often defined by the choices she chooses not to make than the actions she takes. But restraint is worth its weight in gold, imho! Intriguing concepts to explore. the covers look awesome.